When looking at your closet, it may seem that men's button up shirts are in style and you have button up shirts, so you are good to go. Not true, my friend. You want a slimmer fitting shirt. We're not going for super tight and your body shape will also determine how slim is attractive. But, a wide shirt from the 90's is going to feel outdated. Colors and prints don't change as rapidly for men as fit. Try a Calvin Klein shirt compared with what you already own to get a feel for the difference. I chose this one because it doesn't need to be ironed. It's essential that you are realistic about what is REALLY going to work for you- ironing, for example, may not be in the cards. 2. Buy a great coat…. or two. Here in the Northwest, we're rocking jackets or coats about 9 months out of the year. Your coat is covering up your nicely fitted shirt, so be sure you make a great first impression with a coat that reflects your personal style and is flattering. Now that men are able to embrace style once again, don't be afraid to try out some bolder colors if you are drawn to them. I'm a big fan of having a couple of coats or jackets (if not more). Specifically, try a quilted coat that can be dressed up or down, a puffer vest for layering and if you wear a tie or prefer a more polished look, go for a quality overcoat or a peacoat. Like that puffer vest? Try it over a button up shirt and a sport coat. Wearing your quilted jacket? Add a mock turtleneck sweater and a henley shirt underneath. Accessorize. 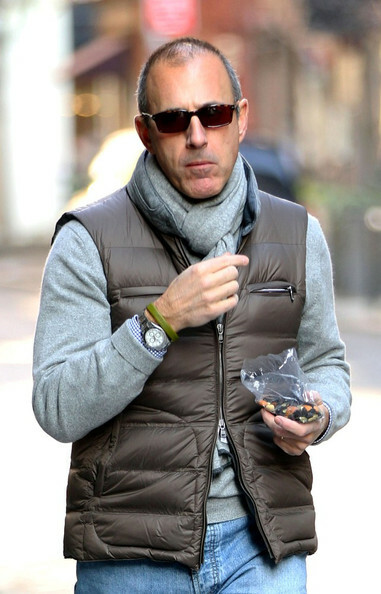 Matt Lauer, another hip man over 50 is doing it! Add a bulky scarf with your peacoat. The weather is always changing and your outfit should allow you to do that easily. After all, a hip urban man is ready for anything. Any other thoughts or ideas? Please share! *I see you thinking that this post doesn't apply to you- well, I'll bet you purchase gifts for men of this age. And, this list of 50 Foxy Men Over 50 is pretty addictive. So there's that.